This gift box has a Net WT of 10 oz. Made all by hand and in small batches. Rich, smooth caramel is combined with hand picked premium Pecans and is topped with Milk Chocolate. These fine confections are sometimes called Pecan Caramel Clusters. 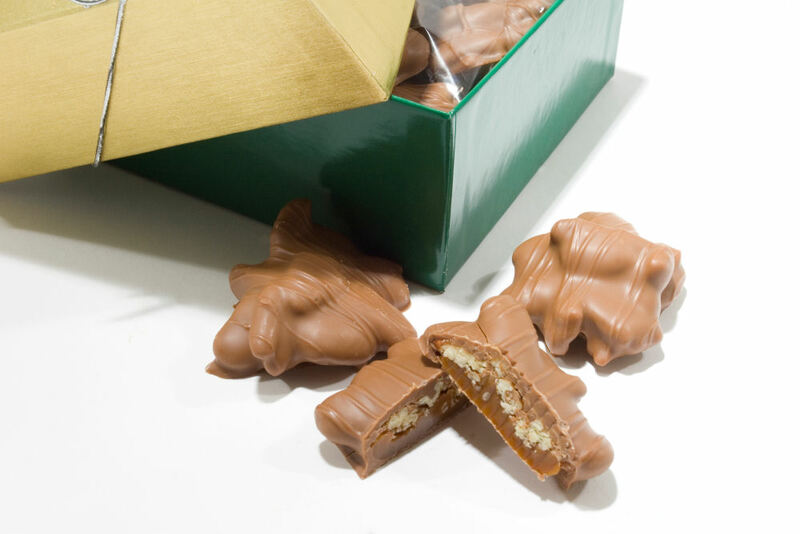 Pecan Caramel Chocolate Turtles/ Pecan Turtles/ Pecan Clusters (Gift Box) - Net WT. 10oz. My friend LOVES chocolate turtles, she have them every day, we live 4 hours away from each so I order them from and she LOVES them. The turtles were very good, however the customer service was outstanding! I will continue to use your company every year for my tax day gifts as the service and execution was flawless, helpful, and patient. The notes were also a nice touch as the cards look great. Thank YOU! I love Pecan Turtles and these are the absolute best! The box is very nice too.